Identify and promote collaborative efforts that enhance the Upstate’s physical and social infrastructure by encouraging quality growth and supporting economic vitality, natural and cultural resources and quality of life in the region. Measure, analyze and report information on the needs and progress of the region on key cross-jurisdictional issues. Ensuring diversity in profession, background, gender, race, age, geography, thought and action will ensure success. Working collectively as a region is the triumph of cooperation over competition. Responding effectively and efficiently to the demands of the global marketplace and identifying appropriate opportunities to leverage resources and work collectively toward a common goal. Enabling leaders to set aside parochial priorities in order to address critical challenges and visualize opportunities for the future. Assisting public, private and nonprofit leaders across the region in building relationships and consensus on issues of regional significance. Ten at the Top and Public Education Partners convened the first-ever regional gathering of School Superintendents, College & University Presidents & Provosts and Business Leaders from across the Upstate. Ten at the Top and regional partners began the Connecting Our Future initiative with the first step being to create a regional vision and actionable strategies that help enhance the ability to move people and goods across the Upstate. The first ever PIQUE Young Leaders Elevating the Upstate event attracted nearly 300 young leaders from across the Upstate to discuss how they can become engaged in shaping the future of the Upstate region. Ten at the Top conducted an organizational record total of 102 regional meetings, forums, presentations, and workshops. Between 2010-2015, TATT conducted 518 regional engagements with more than 26,000 participants. Ten at the Top started the Getting to Know Our Neighbors Upstate bus tours to communities across the Upstate. Ten at the Top hosted the first Upstate Regional Summit: “Rechecking Our Reality.” More than 800 leaders from across the ten county Upstate region came together to discuss how to continue growing economic vitality and quality of life across the Upstate. In partnership with USC Upstate, TATT identified more than 50 Great Ideas for Community Vibrancy and conducted four workshops across the region that included representatives of some of these great ideas from across the state and country. To help cultivate vibrancy initiatives in the Upstate, the Hughes Investments Elevate Upstate Community Vibrancy Grants were created to provide seed funding for local efforts. Utilizing a grant from the Graham Foundation, the Upstate Information Hub (OurUpstateSC.Info) was created to be a repository of regional resources as well as host of a comprehensive schedule of events and activities happening across the Upstate. Ten at the Top started the Our Upstate Vision Forum Series. Each forum focuses on a different topic that impacts current and future growth and planning in the Upstate. The Our Upstate Vision is unveiled during a Regional Vision Summit. 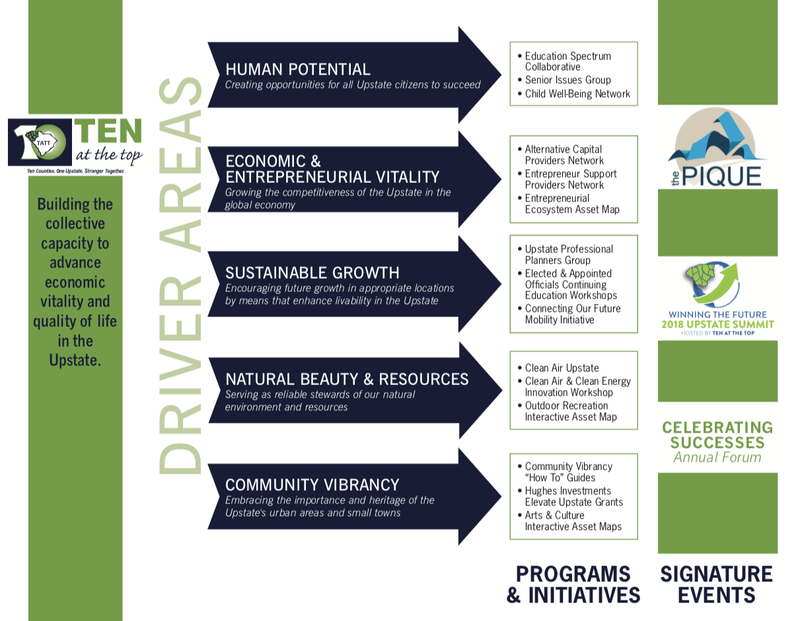 Following the unveiling, five regional task forces were developed to identify actions in the driver areas of the vision: human potential, economic and entrepreneurial vitality, sustainable growth, natural beauty and resources and community vibrancy. Ten at the Top launched the Ten Counties, One Upstate, Your Voice Matters: Creating a Shared Upstate Growth Vision campaign. Over the next year, more than 10,000 Upstate residents provided input and feedback. Ten at the Top partnered with other regional organizations to start the first-ever regular meetings of elected officials from across the Upstate. Upstate Together was incorporated as a non-profit and renamed Ten at the Top (TATT). The first action of Ten at the Top was to build on the input received during the Upstate Reality Check to develop a Shared Upstate Growth Vision. Upstate Together partnered with the Urban Land Institute and received support from many communities, businesses and leaders from across the Upstate to develop and hold a day-long regional planning exercise called the Upstate Reality Check. More than 400 leaders from across the Upstate participated in the Upstate Reality Check, which was held in April. More than 300 leaders from across South Carolina’s Upstate attended a conference called “Upstate Together: Growing by Choice or Chance?”. From this conference, a steering committee of approximately 40 leaders from across region was created under the same name.